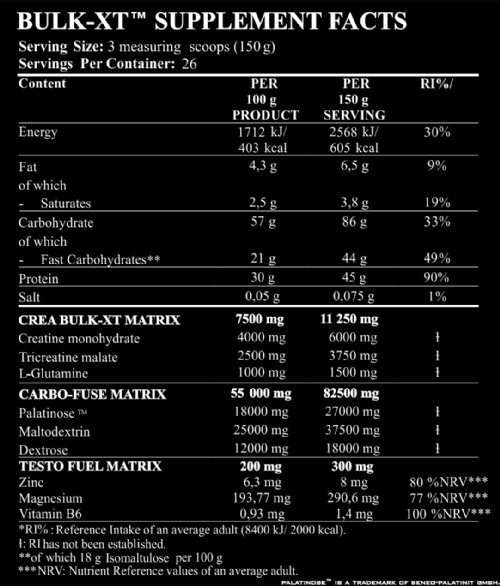 When it comes to real body building, you have to understand that your calorie requirements are going to be increased drastically. You tend to get a feeling that you have to eat, eat and eat. However, it’s not an easy task for you to rely completely on a regular diet, when you are a hardgainer or you need fast and steady source of carbohydrates in combination of premium quality protein after or before workout. 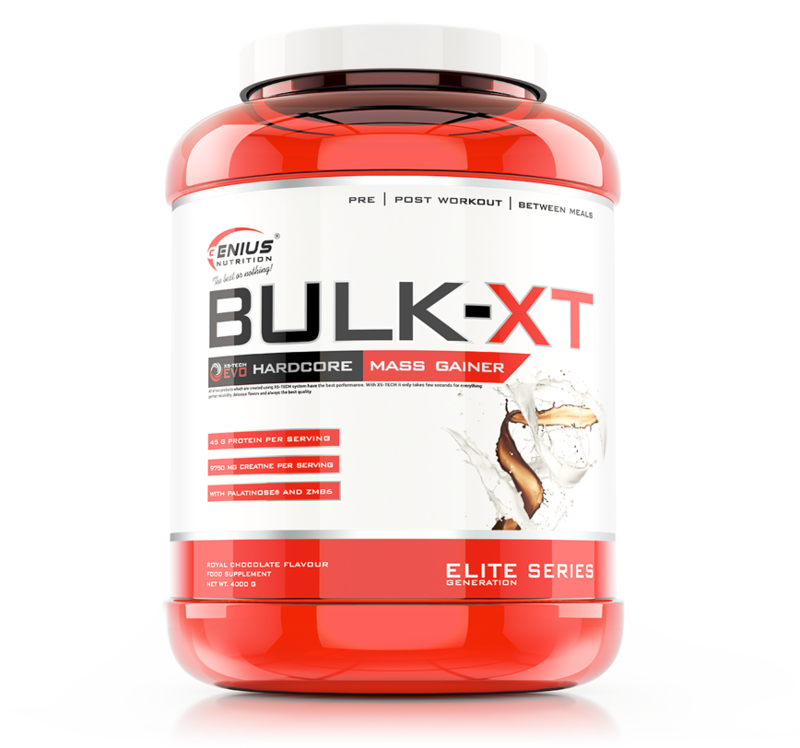 BULK-XT is a scientifically engineered and an efficient mass building formula which is designed for bodybuilder who want to get the benefits of top quality proteins with increased amounts of carbohydrates and huge dose of creatine matrix for real bulk muscle performance. 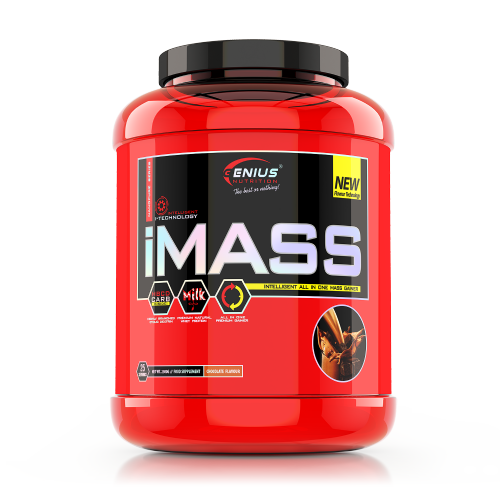 This product is created especially for individuals who find it hard to gain mass, as well as athletes that need a high and super fast carbohydrate meal before and after workout. Palatinose™ is a scientifically advanced sugar substitute designed to taste sweeter than sugar, and yet provide a slow, steady stream of glucose rather than a sudden peak which leads to dip in energy levels and appetite. Palatinose is low on the glycemic index! Carbo-Fuse Matrix – The main reason to consume carbs after your workout is to replenish the muscle glycogen that you burned during your workout. During exercise, you use muscle glycogen as your main source of fuel, which is the storage form of glucose. This is needed in order to generate ATP, which transports energy and is needed for muscle contractions. In order to replenish your muscle glycogen levels after your workout, you need to consume high-glycemic carbohydrates (matodextrine, dextrose), which will digest quickly in your body. The higher the glycemic carbs means a larger insulin release that will increase glycogen storage and increase protein repair. Protein Fusion (Whey protein concentrate, Whey Peptides, Milk Protein Isolate) – Quality protein with easy digesting carbs immediately after training and weight lifting will maximize the recovery benefits by creating a high level of insulin in your blood plasma levels. Insulin is an anabolic hormone and is valuable at helping the body grow lean muscle and recover really fast. Whey protein and Milk protein isolate has high amounts of naturally occurring amino acids the body needs to build muscles. Crea Bulk-XT – This blend contains a huge dose of creatine monohydrate and tri-creatine malate for even more endurance and energy. Creatine is the most popular and effective supplement used by athletes looking to gain lean muscle and strength, 15% size increase in 6 days, instant short term ATP energy, strength and increases testosterone levels and protein synthesis. Testo Fuel Matrix – This blend contains the most important mineral which body needs to enhance healthy hormone production: ZMA. ZMA is promoting recovery after exercise and improving sleep quality. Allergen information: made in a facility that uses soy, egg and nuts. Warnings: food supplements do not replace a balanced diet and healthy lifestyle. do not exceed the recommended dosage!keep out of reach of children. Best before: see the date on the bottom of the bottle. Storage conditions: keep out of reach of children. store bottle tightly closed between 5-30°c (41-86°f). keep away from direct heat, moisture and sunlight. do not store the product for more than 6 months after opening.